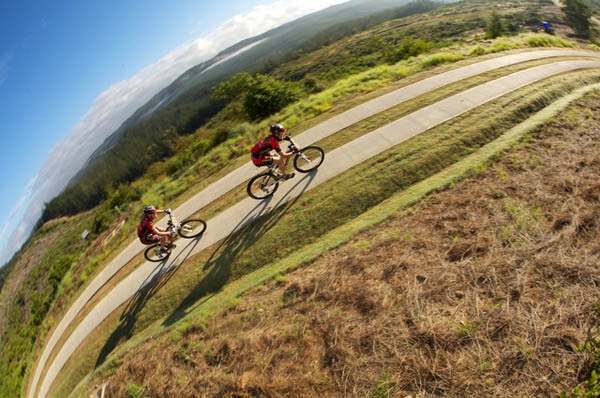 At 8am this morning the fifth Absa Cape Epic presented by adidas  The Magical and Untamed African Mountain Bike Race  kicked off on the Field of Dreams at the Pezula Estate outside Knysna. After months of preparation, 1200 riders from 41 countries started the first day of the 9-day race with the all-new Absa Cape Epic prologue. The race started with a big surprise when South Africas podium contenders Kevin Evans and David George of team MTN Energade claimed the first ever yellow leader jersey for South Africa by winning the prologue with a lead of one minute to second placed Roel Paulissen (BEL) and Jakob Fuglsang (DEN) of team Cannondale Vredestein. Last years Absa Cape Epic winners Karl Platt (GER) and Stefan Sahm (GER) of team Bulls came third. The international pro teams were astonished with the huge gap Evans and George built up, but the two had a very logical explanation. "We have worked together since November last year to develop our team skills as this is a team race and we can only win if both riders work well together," says Kevin Evans. "Weve spent every free minute together on our bikes to an extent that our wives got worried. We were on the phone about three times a day to discuss race statistics, our tactics for each stage, our different roles in the stages and how we would react in case of technical problems. We even matched our body weights and our pedal strokes. We didnt want to leave anything to chance and planned this race almost with military perfection." And David George ads: "A nine day stage race is my game. This were I can use my experience to benefit the team. I am a time trial champion and I know how to ride it. Kevins strength is the technical side, so he was riding all the lines today and all I had to do is stick to wheel and suffer. We trained together for six months and it was also an opportunity for me to pick up some of his skills." The twenty-four Ladies teams in the field were the first to experience the Absa Cape Epic prologue format. The teams started in 30-second intervals and transversed the beautiful 17 km loop route. Not knowing what to expect, as this was the first time they would ride the route, the riders were understandably nervous and had to be prepared for anything. Susan Haywood (USA) and Jennifer Smith (NZL) of team Trek  VW WSD, were the first team to conquer the sought-after red leader jersey. They completed the time trial loop in 42.51,2 minutes, 38.5 seconds ahead of second placed Alison Sydor (CAN) and Pia Sundstedt (FIN) of team Rocky Mountain. Title sponsor Absa was pleased to welcome their Absa Ladies, Hanlie Booyens (RSA) and Erica Green (RSA) in third place. "This prologue was a great way to start the stage race," says Susan Haywood. "It felt good to work our legs after the long trip to South Africa. Since we are used to cross country races, the short and intense racing today was something that suited us, especially since we could race in a safe environment with few riders around us. We are more worried about whats laying ahead"
One of the strongest female teams, Rocky Mountain with mountain biking legend Alison Sydor and Marathon World Cup winner Pia Sundstedt had some bad luck on the first few kilometres, when Pia had a flat tyre and lost two minutes. As experienced race riders they managed to fix the tyre in record speed through the eyes of an amateur rider. However, the two girls agreed that it could have been even quicker. "We learned our first lesson today, "Alison said at the finish. "Two hands are faster fixing a tyre than four. In fact, we really learned a lot about each other and the prologue was a great way of getting used to your partner and working in a team rather than alone. The flat tyre gave us confidence, because we learned that we can work well together under pressure. "Alison has experience in team stage racing, but so far has only raced in the Mixed category. "The benefit of riding with men is that they take responsibility for the technical side of things and you only worry about riding. This is tough enough, because we are physically not as strong as the men. So dealing with technical issues equally with your team partner was actually on of the things that made me decide to race in the ladies category." The favourite Master teams proved their metal by winning the prologue with a comfortable gap. Team adidas William Simpson with Shan Wilson (RSA) who is the South African winning the most stages at the Absa Cape Epic to date, and record Transalp stage winner Walter Platzgummer (ITA) succeeded in their quest of claiming the blue adidas Masters leader jersey on the first day. They completed the 17 km loop in the 16th fastest time overall (36.24,1) and are leading the Masters field with 51,3 seconds. Chasing them are Doug Brown (RSA) and Barti Bucher (SUI) of Absa Masters as well as M.C. Franken (RSA) and Peter Buggle (IRL) of Pragma Masters, who placed second and third respectively. The fastest women riders of the inaugural Absa Cape Epic prologue participate in the top three Mixed teams. Ivonne Kraft (GER) who paired with Nico Pfitzenmaier (GER) as team Joybike Guided by VMT and Maloja finished the prologue first in her category, in a time of 40.15,4, two and a half minutes faster than the first ladies team. However, her pace was set by a man. South Africas top contenders in the Mixed category, Yolande de Villiers (RSA) and Johan Labuschagne (RSA) of team Cyclelab Toyota, only need to make up nine seconds to claim the leader jersey. Third in the Mixed category ranking after the prologue are Tomas Legnavsky (SLK) and Janka Stevkova (SLK) of team Novatec  CK MTB Dohnany. With Kevin Evans and David George winning the yellow adidas leader jersey as well as best being the best African team, the second best African team in the field, Mannie Heymans (NAM) and Melt Swanepoel (RSA) of MTN Energade are looking after the Absa African Jersey for them. The first day success is a feather in the cup for MTN and Energade who joined the Absa Cape Epic this year as sponsors.